The all-time favourite combination of peanut butter and chocolate teams up with predictably delicious results in this easy-to-make PHILADELPHIA 3-Step Peanut Butter-Chocolate Cheesecake recipe. 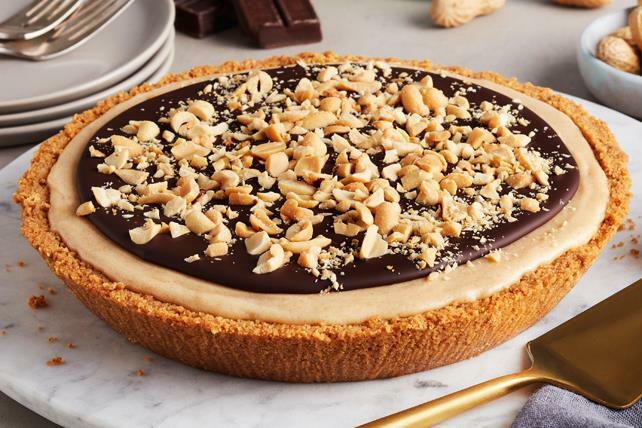 If you're a fan of the pairing of chocolate and peanut butter, this is everything you want in a cheesecake. You won't be disappointed! Beat cream cheese, sugar and peanut butter in large bowl with mixer until blended. Add eggs, 1 at a time, mixing on low speed after each just until blended. Pour into crust. Bake 30 min. or until centre is almost set. Cool completely. Melt chocolate as directed on package; stir in oil. Pour over cheesecake; sprinkle with nuts. Refrigerate 3 hours. Prepare using Kraft Crunchy Peanut Butter.